By now you’ve finished all your after Christmas shopping and broken all your New Year’s resolutions. Now what? It’s February and there’s not a lot going on. Except for of course Valentine’s Day. Remember when Valentine’s Day was a big deal? What would he get me? Jewelry, candy, flowers? It was so exciting. Me, I’d take candy over jewelry any day. It was a given you’d go out for a romantic dinner. Since it was on my mind I thought I’d ask Tom if he’d thought about it. Tom: “Oh yeah, Valentine’s Day. Why don’t you make those lamb chops we like and for sure the Coeur a la Creme, I love that and you only make it on Valentine’s Day.” Another hope dashed… However, Tom has made this dessert once before and the instruction to whip that cream to stiff peaks had him very confused. But not as confused as the time he made another dessert as a surprise for me. That instruction read: whip egg whites until stiff but not dry. He still talks about “That crazy instruction! What the heck does not dry mean, do egg whites get dry and what does that look like?” You get the picture. There are other things to do in February like get a head start on Spring cleaning; invite those friends of yours who didn’t escape to a sunnier place over for dinner. I am going to turn on the fireplace and curl up on the couch with the golf balls I got for Christmas and dream of a lower handicap. Speaking of golf balls, have you seen those new matte colored balls? They are really cool, so that’s what I asked for. I had only seen the deep red and orange ones, so didn’t even know there were other colors. Sure enough, there are. 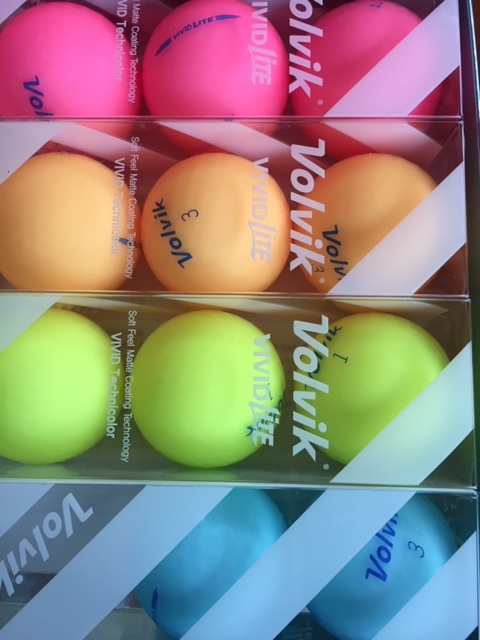 I got a box of the Volvik pastels. Do you think I will be noticed on the golf course with these colors? I think so! If you are spending Valentine’s Day at home and making your own romantic dinner, here is the Coeur a la Creme recipe which is now a family heirloom and will be making it into that cookbook I hope to finish in the next 5 years. By the way, what are you doing for Valentine’s Day? I always enjoy your musings, Stevie! I like your brand of humor!. Im afraid I didn’t grow up with much sentimenality or tradition. Although I do remember my dad buying me , my mom and sister flowers on Valentines Days in my youth. One year in particular, I remember getting an alligator shaped vase with a cactus in it. (Im not kidding.) I wonder if that set the stage for my marriage??😂. A few years ago my sister and I were comparing the sad state of our respective Valentines Days. She had gone to the movie with her husband and they couldn’t agree on a movie, so they ended up in separate theatres. John and I, meanwhile, had stayed home and watched a show where the plot was of a husband who had killed his wife for insurance money. John joked that he was taking close notes. We couldn’t decide which was worse?? What do you 🤔 think?? Happy Valentines to you and Tom! Did I hear you guys will be traveling?? Another funny and enjoyable âStevie Writesââ¦â¦â¦..well done. 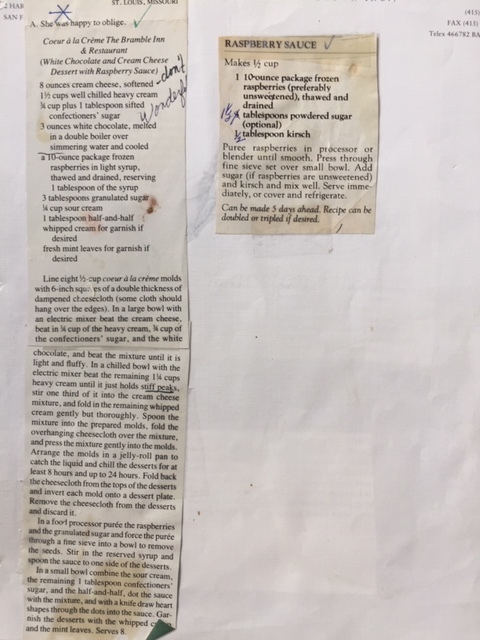 It gave me the idea or notion to ask Selena to use the attached recipe to whip up that delicious sounding Coeur a la CrÃ¨me dessertâ¦.and while sheâs at itâ¦.since Iâm not so fond of lamb, ask her to substitute a tasty medium rare prime rib roast. Now what sort of reaction do you think I should expect? No need to guessâ¦.I know exactly what Selenaâs response would be. Hence, Iâll be going with the candy or flowers! Thanks John! Yes, I know what Selena’s response would be to that simple request. It’s not hard at all to make although the recipe looks daunting, it’s not. Candy and flowers can’t miss! Thanks for the laugh! I hope Tom doesn’t see this and get any ideas. 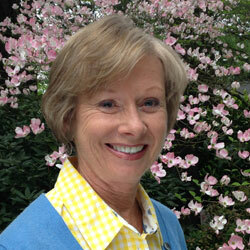 Valentine’s day is for the dating and newly married!